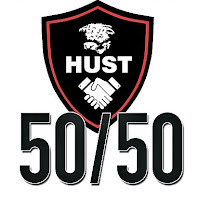 Hereford supporters far and wide can now enter the matchday draw with the introduction of a HUST 50/50 season ticket. This provides fans, who may not be able to make a specific match at Edgar Street, a chance to win a prize at all home Vanarama National League North, FA Cup and FA Trophy games for the 2018/19 season. Online entries can be made up to 5pm on Friday, 3rd August prior to the Bulls first league game of the new campaign against Blyth Spartans. Entrants will receive an email detailing their individual HUST 50/50 draw ticket numbers to further enjoy the matchday experience, with winning ticket numbers announced on Radio Hereford FC for the benefit of exiled supporters, in addition to immediate social media updates. HUST will also contact winning online entrants by email – so there is no need to make a claim. It’s that easy!